Hey all, Happy Saturday! Well Sale-a-Bration is over and I hope you all got what you wanted before it came to an end last night? I have some UH-mazing news! 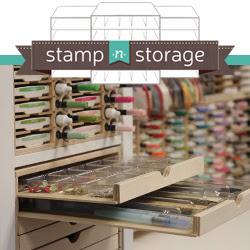 I am a new affiliate member of Stamp n Storage! I have been a HUGE fan of their products for a few years now, ever since I discovered them on line. I am totally in love with all of their storage solutions. It is quality FURNITURE! It's all solid wood and well thought out and you can tell they really care about their craft and care about their customers. I find that their customer service is top notch, much like Stampin' Up! I personally use their combination Ink Pad holder for my ink pads and re-inkers, I have the largest lock down punch holder...this dramatically improved my punch storage!. I am using the steel rule die holder....I love this! I am able to keep my different platforms on here along with all of my steel ruled dies. I don't currently use the storage boxes designed for the magnetic die sheets only because I need to remain portable, so to meet my needs, I keep my dies in their original envelopes from Stampin' Up!, but I trim the dies down to fit into the envelopes and then I just place them into a couple of different baskets that I have and this works great for me. However, if I didn't travel so much with my dies, I would have the totes in a heart beat! I also use the 6 drawer storage unit to keep things I like to have close at hand like my bakers twine and linen thread. I also keep adhesives like my tear n tape and Scotch tape in one drawer. I keep post-it notes in another and a current embellishments so that they are easy and quick to get to; last but not least, I have an overstuffed ribbon shelf and plan to get another one. I am planning a craft room tour here very soon so that you can see how I store my supplies and stay organized. Currently, all of my Stamp n Storage remains in its natural state. I haven't painted nor stained any of it as I am still deciding on what to do and what color? I am debating on staining the wood to match the bookcases I have in the room or try to or do I paint ALL of my craft furniture and storage bright white to brighten everything up, or do I make all of the furniture black with the table top butcher block? Decisions Decisions Decisions? If you have any opinions please share below in the comments as I am open to your ideas! 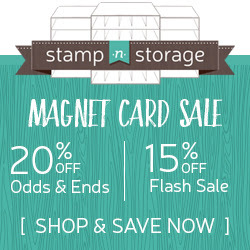 In the meantime, if you find that must have at Stamp n Storage item, please consider using the link here on my blog as I would be so very appreciative. And before I forget, there is a sale right now on the die magnets and I will tell you from my own personal experience, these are THE BEST!